Existentialism is a main theme of Ian Mcdonald’s brilliant 1994 Necroville (published in the US as Terminal Café). Pyrotechnic poetry blasting from the pages, the possibilities of nanotechnology have never been related in such vivid profundity. The scene lower California of 2063, the dead live again in this flames-and-leather cyberpunk exploration of the meaning of life and death in a world gone mad with possibility. In line with McDonald’s penchant for multiple viewpoints, Necroville’s story is told through the eyes of five friends who meet every year at Terminal Café on the Mexican Day of Dead. Santiago (the man quoted above), a drug artist, has experienced life in every way possible and seeks something more, possibly death. Camaguey is terminally ill and must decide what to do with the hours remaining. Touissant is an aguilar, an eagle-man, trying to fly away from his family’s legacy. Trinidad is a dinosaur hunter who hammers bodies “to the crucifix of fear she drags across her life”. And Yoyo, an independent lawyer, must solve the mystery of why the massive nanotech corporation TeeTee wants her dead. But it’s the place they meet that comes most alive. The streets and alleyways of the barrios—the necrovilles—they wander to meet at the café are much more than the neon, whores, and black leather that glitter on the surface. Space opera, big dumb object, and first contact maintaining their limits of sub-genre, nanotech novels have proven more variegated. Stephenson’s Diamond Age, Stross’s Glasshouse, and Ian Mcdonald’s Necroville present three very different views on the possibilities for the concept. The prologue short, McDonald’s take is obvious from the beginning: “Tesler’s Corollary: The first thing we get with nanotechnology is the resurrection of the dead.” So while theme parks have gone bankrupt trying to contain the dinosaurs they accidentally unleashed and designer drugs are available on the market with narcotic qualities like never before, the main focus of nanotech in Necroville is the superhuman status humans achieve after death, mortality no longer a limitation. Skeletal alteration, skin changes, even life in space are choices for the dead. (They are a more realist take on Mieville’s “remade”). The possibilities so appealing, in fact, numerous intentionally die to have the doors of opportunity open. Like people today, McDonald posits those of the future will likewise yearn for more from life, want to push the limits, and in his context, envy the dead. Potential problems with the novel are more a matter of taste than technical. Some reviewers have complained that McDonald does not thoroughly explain the technical background of his nanotech, which is true. However, worldbuilding was never the aim. McDonald focuses instead on the personal and ethical aspects of technical achievement, the book needing to be approached as such. Some readers have also complained about the “confusing style” and “lack of cohesion amongst the character viewpoints”. Suffice to say, McDonald’s narrative is indeed allusive, most often describing matters indirectly. Attentive readers who enjoy stories to cogitate upon as they read will love the book (e.g. William Gibson, Gene Wolfe, Thomas Pynchon, etc. ), while those who prefer linear narratives with overt info dumps and plot hand-holding will balk (e.g. Alastair Reynolds, Peter Hamilton, Arthur C. Clarke, etc.). This is mature sci-fi (yes, even with dinosaurs), thus readers expecting an easily digested story will be disappointed. Combining original genre ideas with moral exploration, Necroville is a sci-fi tour de force. From the visceral beauty of the prose to the variety of ways in which life and death are examined over the backdrop of the resurrection of humanity, McDonald has staked a claim for himself in the existential examination of nanotech. Cyberpunk through and through, fans of Gibson, Brunner, Stephenson, and Sterling will want to check out this offering. Having much, much in common with the style and presentation of his award-winning River of Gods, Brasyl and The Dervish House, Necroville proves McDonald’s earlier publishings highly underrated and worthy of attention. I had never read a David Brin book. Hearing his background was in math, physics, astronomy, etc., I went about buying one of his books with trepidation. Isaac Asimov, Vernor Vinge, Alastair Reynolds, and other popular sci-fi authors may be good scientists, but they lack the touch and feel of an inborn writer, the style of their novels suffering for it. Not written in glorious prose, Startide Rising was nevertheless a pleasant surprise. A fun mix of hard sci-fi and space opera, Startide Rising is a unique story that sets itself apart from derivative sci-fi for its premise. The story of a dolphin and human crew hiding on a water planet, they are holed up in an attempt to escape a galaxy of species that want the relic tucked away in the hold of their damaged ship. While the various aliens war in space above, the crew spend their time trying to extrapolate metals and materials from the sea and land to repair their ship. The mysteries they uncover on the uncharted planet and the relationship problems that result from the cabin fever only make their escape all the more unlikely. Dolphins in space? the average person blinks. Yes, it’s true. “Uplifted” from their primeval state to one on par with human sentience thanks to advances in technology, the majority of the story is told through human-dolphin and dolphin-dolphin interaction. If this idea seems implausible to the point of annoyance, don’t read the book. Readers with an open mind will quickly discover that Brin takes the concept seriously and does not cartoon-ify the water mammals like Vinge’s canines in A Fire Upon the Deep. Each an individual, on one hand Brin portrays the dolphins having a mindset not altogether different than humanity’s. The dolphins experience many of the same emotions and thoughts, anger, greed, pride, honor, etc. On the other hand, however, is speculation on what effect being raised in a water environment and communicating via sonar, squeaks, and whistles would have on culture, habits, and beliefs. Star Trek aliens often having more in common with humanity than Brin’s dolphins, thinking of the finned creatures as sentient creatures requires little stretching of the imagination under his guidance. The hard science aspects of Startide Rising are numerous. As mentioned, Brin takes the dolphin idea seriously and step by step imagines what a shared human-dolphin environment would require from a practical perspective. The accoutrements for each are well detailed, from airdomes and cyber-harnesses with manipulator arms for dolphins to underwater sleds and breathing apparati for humans. Their space ship is designed for each to live in their natural environment, not to mention that its inter-galactic characteristics, hull design, gravity inducers, etc. show a basic understanding of astrophysics. Topping things off is the knowledge of planetary geology and biology Brin uses to motivate the plot. The physical and chemical properties of waters, metals, land masses, and all else the crew discover are taken into consideration, often creating difficulties the crew must overcome. That being said, there are several unrealistic aspects of the story. Though occurring infrequently, the space opera elements of Startide Rising nevertheless have a major effect on plot, particularly the denouement. Certain moments fly in the face of common sense, while at other times the narrative wholly contradicts itself in order to develop tension in the moment. For example, the incredible racket the crew make while supposedly in hiding (bombs, land mass drilling, etc.) 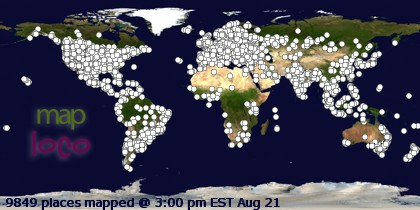 would seem to trigger any monitoring or tracking devices the aliens overhead would have in place. Yet, no consequences incur, the plot moving smoothly forward for it. 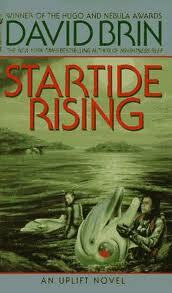 It would be remiss not to mention the anthropological side of Startide Rising. Along with the dolphins, Brin’s portrayal of the encounters with other species is not one divided by a line of good and evil. The cultural elements, particularly a few scenes where the humans interact with aliens, are dealt with in realistic rather than shoot-em dead fashion. Likewise, the linguistics of the novel show a considerable amount of preparatory work, human-dolphin interaction using more than one language. Thus, the backdrop of the story may be grand, but Brin does a good job of keeping things relatively realistic from a cultural perspective. In the end, Startide Rising is unique amongst hard sci-fi/space opera novels for its dolphin premise. Though not prosaic, the writing style never interrupts the story. Characterization black to white to gray and the science detailed to the point of plausibility, Brin insults his readers’ intelligence only with the space opera moments. The background story revealed enticingly slowly (he builds to the climax well) and character interaction for the most part realistic, the novel also shows that Brin is more than just a scientist, the basic skills of a storyteller working in parallel. Seeming a combination of Brian Aldiss (the hard and soft science aspects) and Alastair Reynolds (the grand scale and space opera elements), fans of either author will want to check out the book. Those intrigued by Gibson’s inclusion of a sentient dolphin in “Johnny Mnemonic” will love the manner in which Brin has fleshed the idea into a complete novel. The current generation of sci-fi fans will undoubtedly be familiar with Alastair Reynolds’ Conjoiners and Ultras. Two groups of post-humans inhabiting his universe, the former have augmented consciousness toward intra-communities, while the latter have undergone major biomechanical reconstructive work to enhance capabilities. Original ideas, yes? Unfortunately, no. Acknowledging the debt in his outro to Galactic North, Reynolds admits if it weren’t for Bruce Sterling’s Schismatrix Shaper/Mechanist universe, Revelation Space’s trans-humanism may have never taken shape. A work of truly unique imagination, Sterling deserves far more exposure than acknowledged homage or footnotes to cyberpunk he has been given in the three decades since this novel’s publishing. Schismatrix opens with one of the most bizarrely sublime assassination attempts ever depicted in literature—the possibilities of sci-fi used to full effect. The main character, Abelard Lindsay, escapes but is subsequently exiled to a lunar colony where he must rebuild the social and political network cut off by his would-be assassins. Though born a Mechanist (people who alter their bodies with software and biomechanics), he trains as a Shaper (genetically modified people with special mental capabilities), and is thus an asset to both, a fact he attempts to spin for his own benefit in exile. As the decades and centuries pass, the political situation evolves, and reverts back on itself time and again, bringing Lindsay to face a final decision that transcends the cracked, post-human world he is immersed in. Schismatrix more a pastiche of novellas than linear storytelling, tension builds in the setting rather than over the course of the narrative. The events and circumstances of Lindsay’s life find him in a handful of locales and situations, each more imaginative and peculiar than the next. Arthur C. Clarke nowhere to be seen, Sterling never paints these scenes in beautiful colors. The colony Lindsay is exiled to suffers from severe atmosphere problems, while a pirate ship he later finds himself on clanks and clutters its way across the universe, the crew never quite predictable in their twitchy addictions and edgy compulsions. Given the extreme lack of similarity between Shapers/Mechanists and humanity today, Sterling’s narrative appropriately keeps the reader at a distance from the characters. Lindsay is not a hero to exalt or cheer for, but is a man whose life is for observation in comparison to our own, for better and worse. After all, how can one properly empathize with a person who has been alive for centuries and no longer exists in the body they were born with? Soldiers returning from war often alienating themselves due to their experience of being so far removed from normal life, Sterling is correct to detach readers from Lindsay. What results is both an interesting read and social statement. More politically overt than Gibson’s brand of cyberpunk, Schismatrix focuses on the interaction of various factions throughout his created universe. Shapers and Mechanists have their agendas, as do a variety of other groups, including aliens calling themselves the Investors. Groups within each of these associations likewise have goals that don’t always agree with their peers’. This makes for some occasionally confusing shifts in plot, but shifts that well reflect background realpolitik. Attentive readers will not have a problem with these transitions, while those accustomed to Lois McMaster-Bujold, John Scalzi, or Vernor Vinge’s brand of sci-fi may feel lost upon occasion. In the end, Schismatrix is an underrated work deserving of wider acclaim. More than the realist tone of its politics, the book is filled with original ideas, from setting to technology. Not a novel in the standard sense, the book is more a collection of vignettes welded together by Sterling’s fertile imagination. A great examination of post-humanism, readers of William Gibson, Ian McDonald, John Brunner and cyberpunk in general will want to check it out. If interested, buyers may want to seek out Schismatrix Plus, a book containing not only the novel but also all the short stories from the Shaper/Mechanist universe. Sterling a better writer of short fiction, these stories cap what is a great book in itself. Henry David Thoreau is a name known to many. But with good reason, it’s not for his poetry. A far better prose stylist than poet, Thoreau nevertheless dabbled in the medium many times in his life, scattering verse here and there throughout his extensive journals and notebooks. 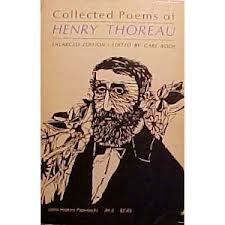 Collected for the first and only time, Collected Poems of Henry Thoreau is the more abstract side of the renowned philosopher and naturalist. As one would expect, nature, transcendence, and personal reflection take center stage in Thoreau’s poetry. Though seeming he would be a better writer of free verse, Thoreau nevertheless limits himself to rhyme and meter, form exhibited in all of Bode’s selections. Thus, the same painstaking care with which Thoreau went about writing prose is evident in his verse. Words and phrases are carefully selected, but unfortunately most often to meet the demands of closed verse rather than expression. Several selections stand out, but overall the collection is a bit tedious; there is a reason Thoreau is known for his prose. In the end, Collected Poems of Henry Thoreau is recommended only for completists, scholars, or enthusiasts of the natural philosopher. Nothing spectacular about the collection, the selections merely support his prose work rather than inform it. Moments of beauty do exist, but by in large expectations for the work to be as profound or touching as Walden, The Maine Woods, etc. should be kept to a minimum.